A promotional poster has been available since the Jem And The Holograms started filming last April, but the first real still photo is now available. The picture is running in the March 2015 issue of Elle, but io9 has blown up a scan for our benefit. We can see from the grainy image that Jem’s signature makeup is still there, the hair is less ’80s, and the outfits are somehow more ’80s. 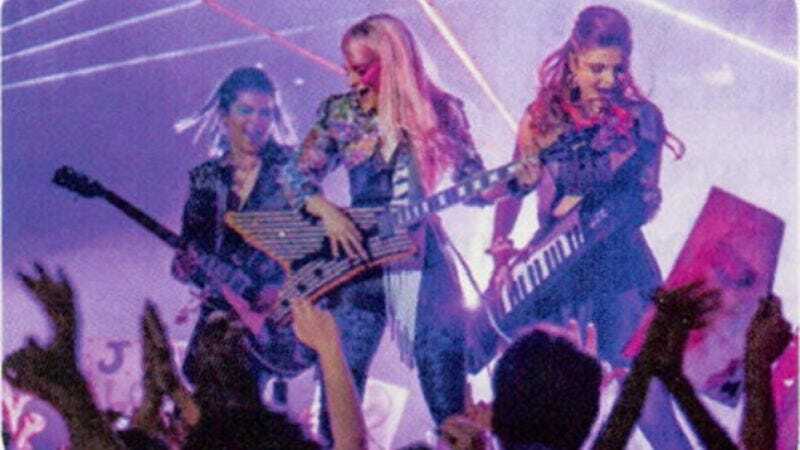 Kimber rocked the synths in the original cartoon, so the keytar must be part of director Jon M. Chu’s mission to give his modern-day adaptation some edge. After all, it is well known that keytar players run the risk of being assaulted during impromptu street performances. Noticeably absent is drummer Shana, which may just be the way the shot was framed but still represents a level of disrespect usually reserved for bassists and/or Ringo Starr. There’s been some folks upset about the production, including those who thought maybe women could have been involved somewhere behind the camera, concern that Molly Ringwald will be in front of the camera, and everybody who saw what Chu did with his feature-length phallic-gun montage, G.I. Joe: Retaliation. Jem And The Holograms will either bring outrageousness back in style, destroy childhood memories, or a little of both when it hits theaters on October 23, 2015.